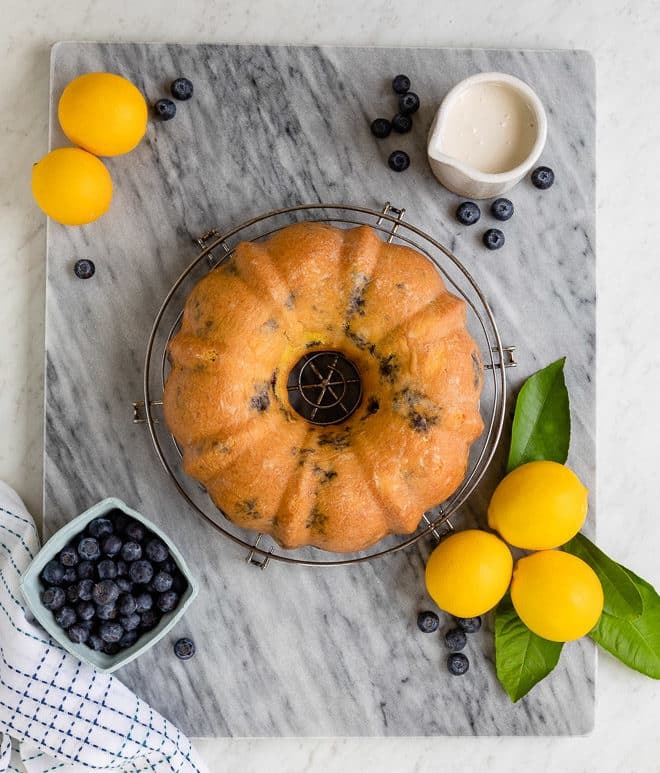 My ultimate Lemon Bundt Cake recipe – now updated with blueberries! 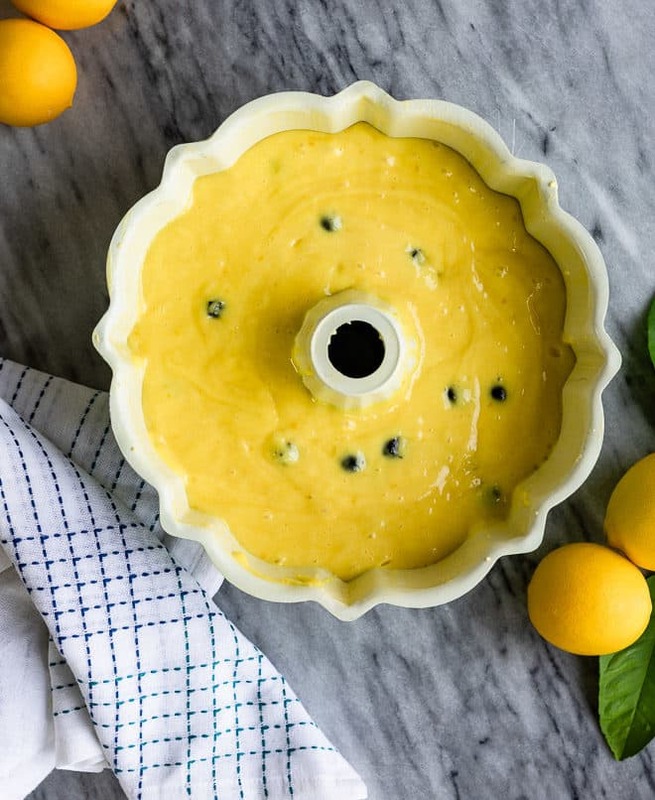 Dress up a boxed lemon cake mix for the ultimate easy spring dessert. Trust me, you’re going to love it. 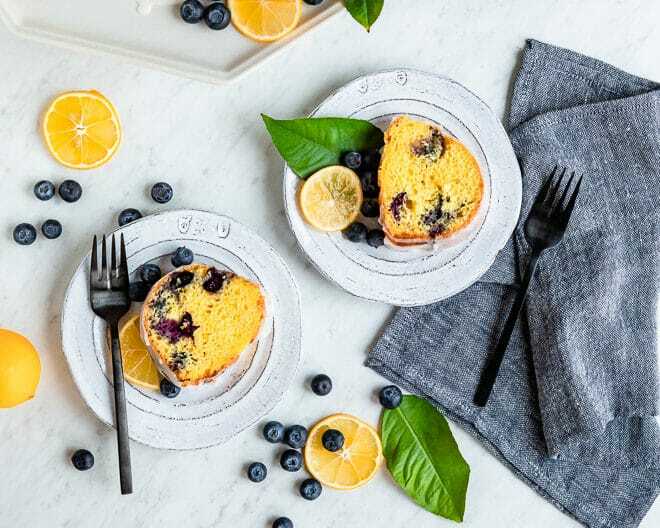 This Lemon Blueberry Cake is not only gorgeous, it’s delicious: It has the perfect tender crumb and blueberries, fresh or frozen, baked into the cake like sweet little polka dots. 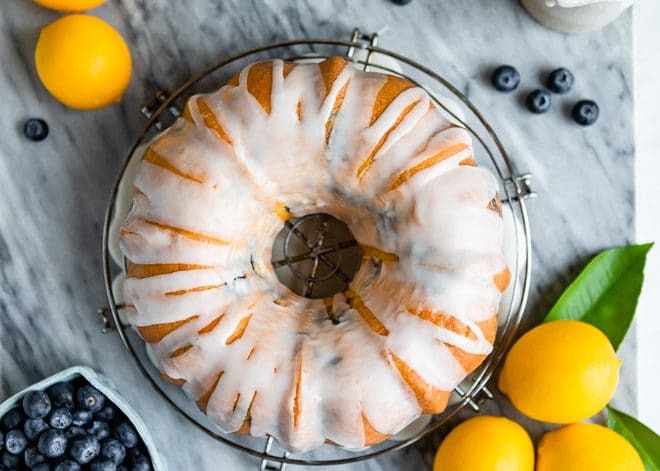 But what is so fabulous—and it’s a trick that restaurants and bakeries use every day—is that this lemon blueberry bundt cake is made with… mix. I love to make everything from scratch, but lemon cake mixes are one of my favorite exceptions. Add a powdered sugar glaze for a picture-perfect finishing touch on Easter Sunday, Mother’s Day, or any day at all. 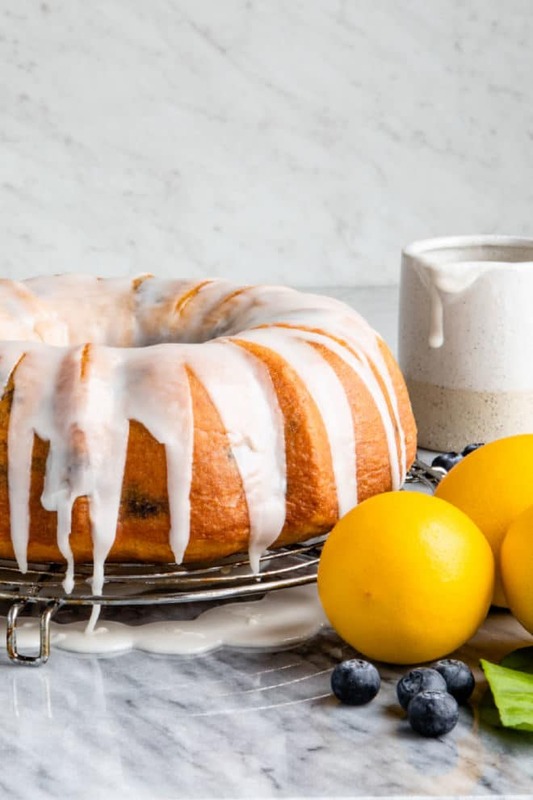 What size bundt pan do I need for Lemon Blueberry Cake? Any large (12 cup) bundt pan will do. I use this one, but if you have a favorite one, by all means, use it. 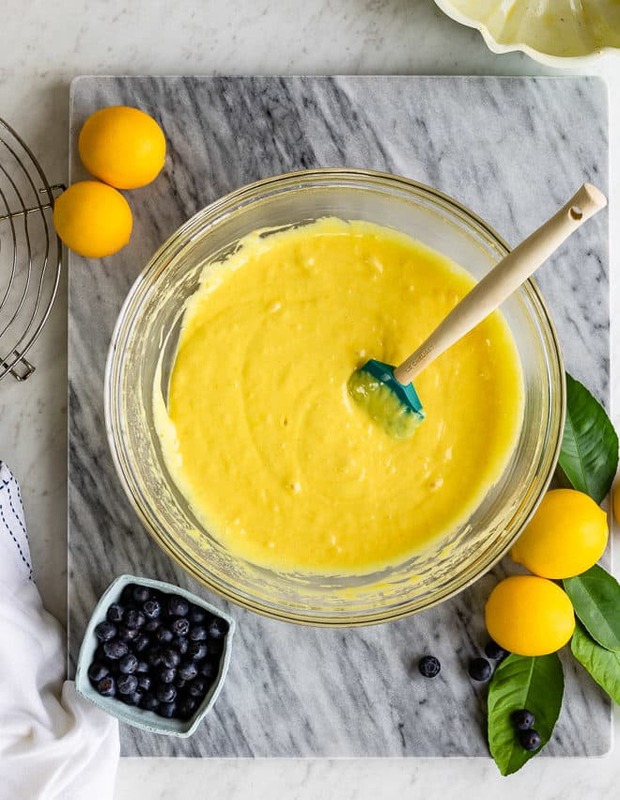 Where do I find lemon blueberry cake mix? There’s no need to find a lemon blueberry mix; you’ll be adding fresh or frozen blueberries later on. Just look for any brand of store-bought lemon cake mix and dried lemon pudding mix. Every grocery store has several brands to choose from. Gather your ingredients: lemon cake mix, lemon pudding mix, eggs, vegetable oil, eggs, lemon juice, lemon zest, and water. And blueberries! Make sure everything, even the eggs, are at room temperature. Next, in a large bowl, whisk together cake mix and dry pudding in a large bowl. Add water, oil, lemon juice, eggs, and lemon zest and stir to combine. Fold in blueberries and pour into prepared pan. Bake for 40 minutes. Now you’re talking! Cool the cake 15 minutes in pan. Invert on to cooling rack set over a baking sheet and let cool completely. To make the powdered sugar glaze, whisk together powdered sugar, water, and vanilla. 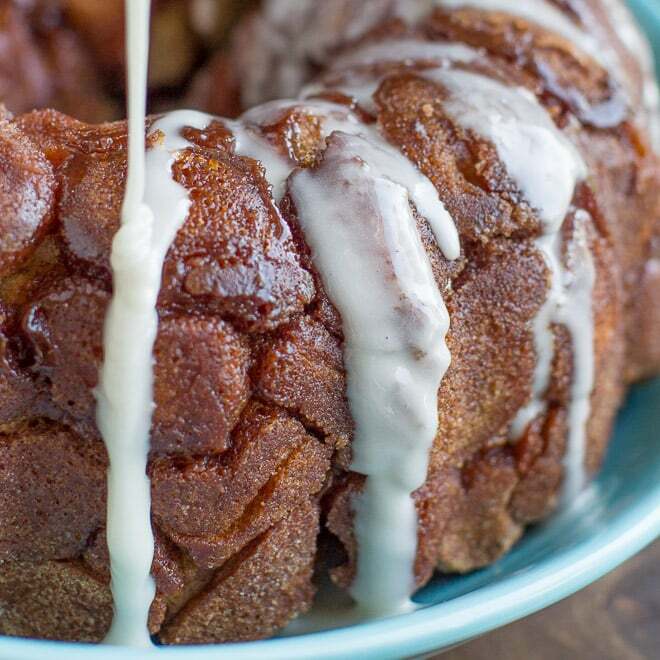 Drizzle over cooled cake and let glaze harden for at least 10 minutes. How do you make Lemon Blueberry Cake with cream cheese frosting? If cream cheese frosting is your thing, then I recommend baking the cake as a sheet cake or layer cake–it will make it easier to spread on the frosting. I also like to add a little lemon zest to the cream cheese frosting, but that’s entirely up to you. 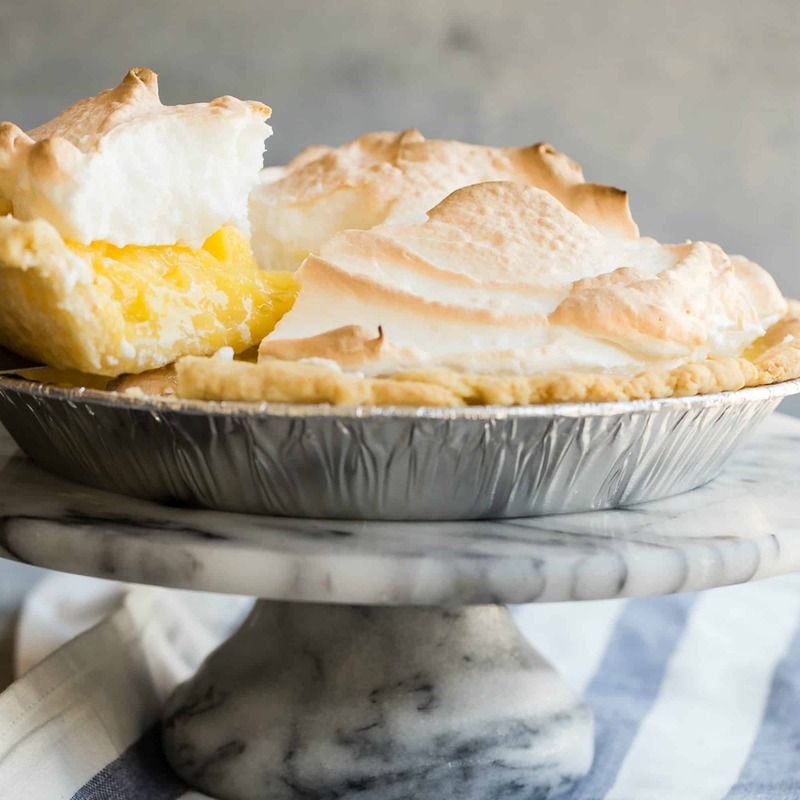 In a large bowl using a mixer or by hand, beat together cream cheese, lemon zest, lemon extract, and powdered sugar. Set aside. 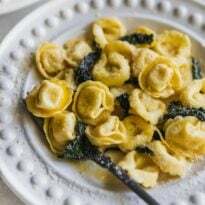 Pour heavy cream into a separate clean, large bowl of a stand mixer. Beat on high until it holds shape and peaks form, about 3-4 minutes. Fold whipped cream into cream cheese mixture until no streaks remain. Spread frosting on top of cooled cake. Sheet cake, bundt cake, or layer cake, here’s how to make Lemon Blueberry Cake delish. 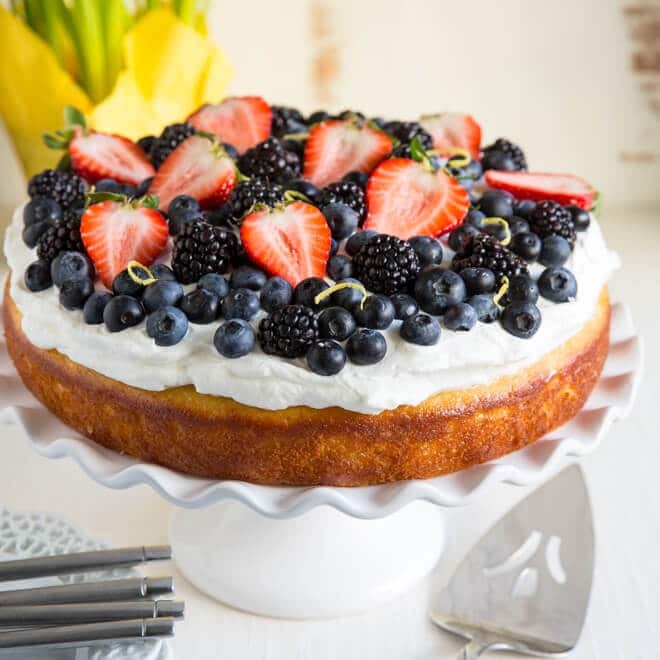 To make a lemon blueberry layer cake: Divide batter between two 9 inch cake pans and bake at 350 degrees for 20-25 minutes. Spread the whipped lemon cream cheese frosting in between cooled layers, along with some fresh blueberries. 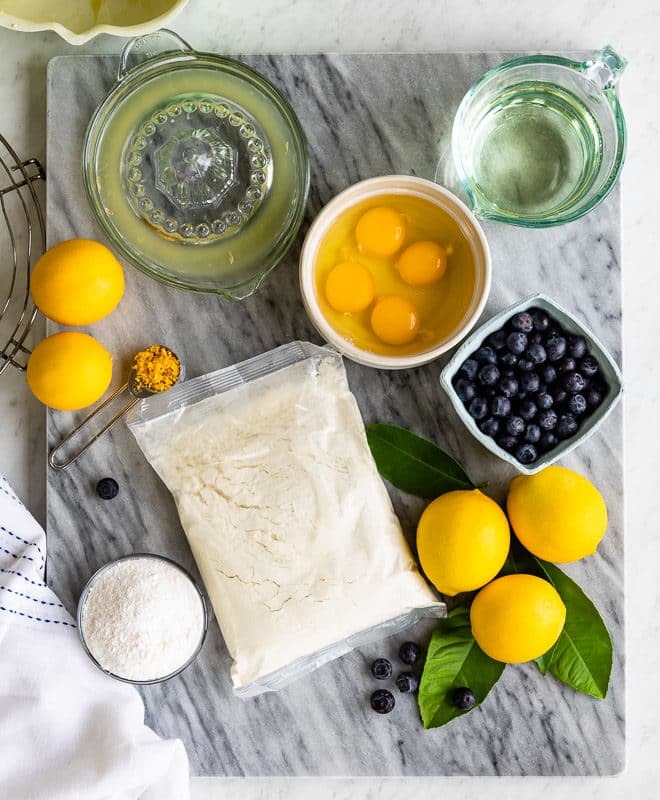 To make a lemon blueberry sheet cake: Grease a 13 x 9 inch baking pan. Pour into prepared baking pan and bake at 350 degrees for 30-35 minutes, or until toothpick inserted in middle comes clean. If using glaze, poke holes in the cake with a wooden skewer so the glaze can run into the holes and flavor the cake. If using cream cheese frosting, allow the cake to cool before frosting. To make lemon blueberry cupcakes: Line a 12 cup muffin tin with paper liners and set aside. Spoon the batter into the prepared muffin cups, filling them 3/4 of the way full. Bake at 350 degrees for 16-20 minutes, or until a toothpick inserted in the center comes out clean. 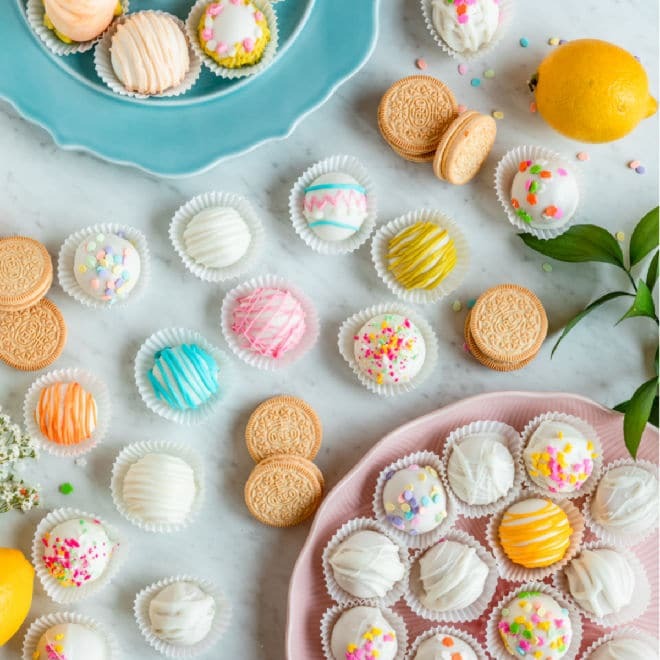 Allow cupcakes to cool in the pan for 5 minutes before transferring them to a wire rack to cool completely. Once cupcakes are cool, frost and decorate. How do you keep the blueberries from sinking into the bottom of the cake? Tossing fresh or frozen blueberries in 1 tablespoon of flour before baking helps the blueberries stay dispersed throughout the cake and not sink to the bottom. Oh, and there’s no need to thaw the frozen berries before adding to the batter–just throw them in! Also, use the recommended amount of blueberries. Adding too many might overwhelm your cake during the baking process; it might weigh the cake down and cause it to cook unevenly. 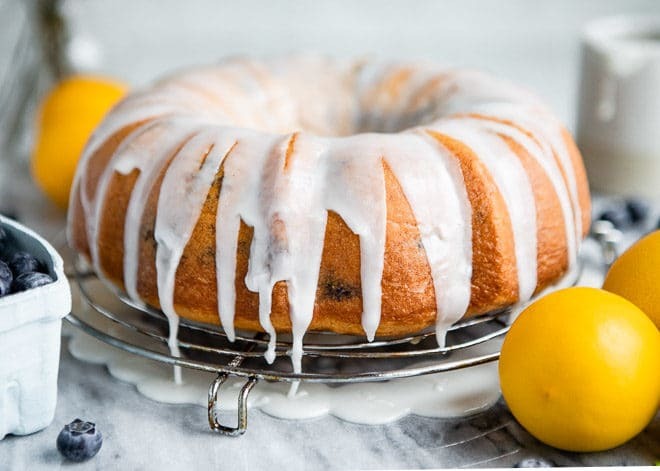 In case you are a lemon fanatic and want all the lemons, all the time, you can make the powdered sugar glaze with lemon juice in place of the water and vanilla and it will give the glaze a super tart taste. I sort out all the different and fun ways to flavor a basic powdered sugar glaze in my recent how-to, in case you’re interested. Have fun! 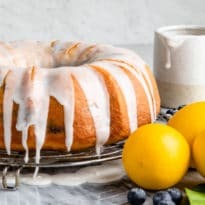 My ultimate Lemon Bundt Cake recipe - now updated with blueberries! 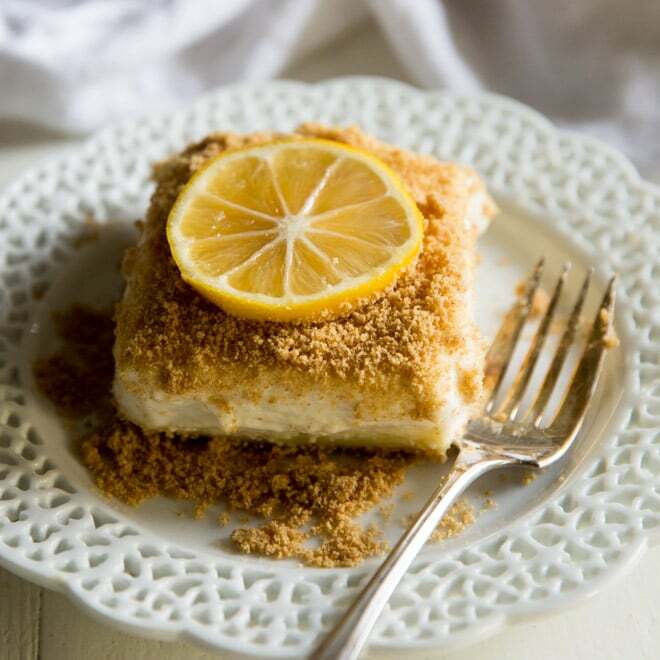 Dress up a boxed lemon cake mix for the ultimate easy spring dessert. Trust me, you're going to love it. Preheat oven to 350 degrees. Generously coat large Bundt pan with shortening or nonstick spray. In a large bowl, whisk together cake mix and dry pudding in a large bowl. Add water, oil, lemon juice, eggs, and lemon zest and stir to combine. Carefully fold in blueberries. 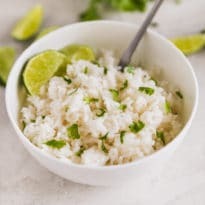 Pour into prepared pan and bake for 40 minutes or until a toothpick inserted comes out clean with a few crumbs attached. Cool 15 minutes in pan. Invert on to cooling rack set over a baking sheet and cool completely. Whisk together powdered sugar, water, and vanilla. Drizzle over cooled cake and let glaze harden for at least 10 minutes.